1. Heat the oil in a wide non-stick frying pan, then add the gnocchi and fry for 4 minutes, without turning. Turn the gnocchi by scraping them up with a fish slice (some tasty crispy bits will already be starting to form) then cook for 4 minutes more, until golden, puffed and crisp. Tip into a bowl. 2. 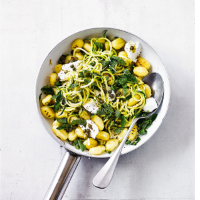 Add the courgette spaghetti to the hot pan, cook for 1 minute over a high heat until just starting to wilt, then stir in the garlic, capers, lemon zest and a squeeze of juice, if needed, and seasoning. Remove from the heat. 3. Fold in the gnocchi, Parmigiano and most of the mint. Dot with the ricotta. Scatter with a few more mint leaves and serve with more lemon at the table. If you have courgettes to use up you can make your own courgette spaghetti using a spiralizer or julienne peeler or slicer. You can use these for autumn squash too.